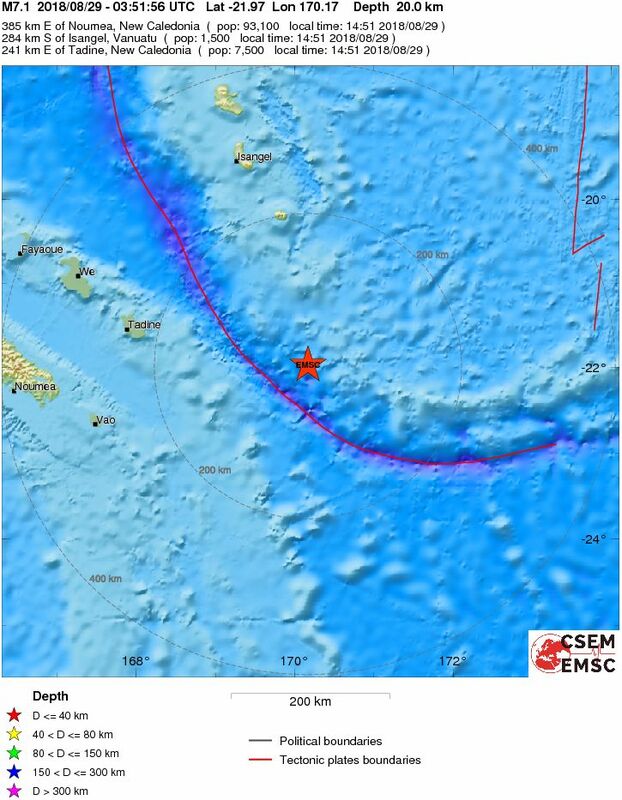 August 29, 2018, M 7.1 earthquake about 300 km to the east of the island of New Caledonia in the southwest Pacific Ocean occurred as the result of thrust faulting on or near the plate boundary interface between the Australia and Pacific plates. Focal mechanism solutions indicate the earthquake occurred on either a shallow fault striking northwest or on a steep fault striking southeast. 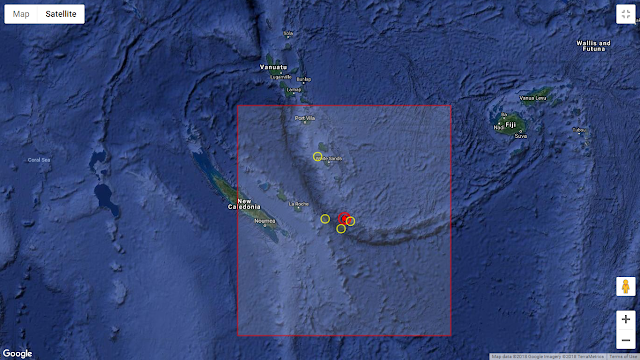 At the location of this earthquake, the Australia plate moves towards the east-northeast with respect to the Pacific at a rate of approximately 78 mm/yr. At the South New Hebrides Trench, Australia lithosphere converges with and sinks beneath the Pacific plate, descending into the mantle and forming the New Hebrides/Vanuatu subduction zone, stretching from New Caledonia in the south to the Santa Cruz Islands in the north, a distance of about 1,600 km. The August 29, 2018 earthquake occurred approximately 50 km to the east of this trench, and its location, depth, and focal mechanism solution are all consistent with it occurring on the subduction zone interface between the two plates. 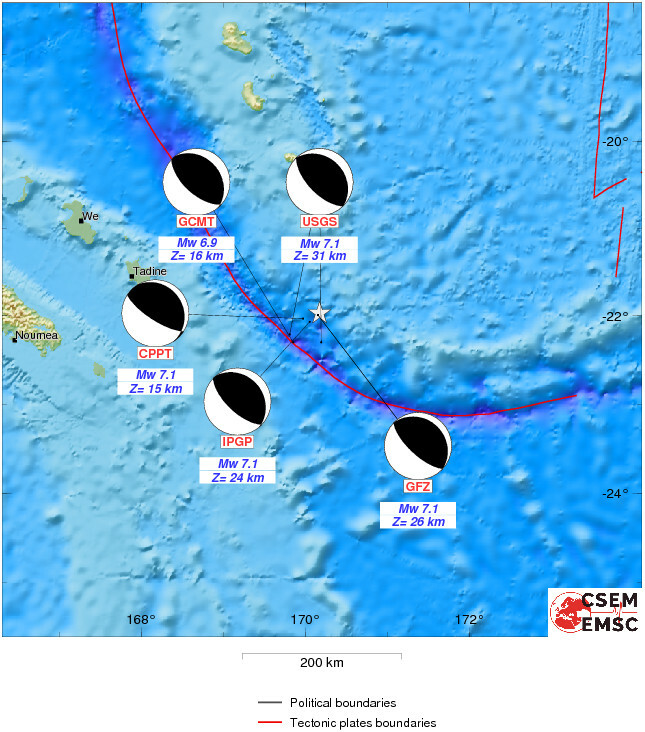 The Loyalty Islands region is very active seismically, and the region within 250 km of the August 29, 2018 earthquake has hosted 20 other M 7+ earthquakes over the preceding century. The largest was a M 7.7 earthquake in May 1995, which was located about 100 km to the south of today’s event, and to the southwest of the oceanic trench in the region commonly referred to as the outer rise. One of the most proximate of these historic earthquakes was a M 7.3 thrust faulting event in December 2003, about 30 km to the west of today’s earthquake. The 2003 earthquake was part of an active sequence of about 250 M 4+ events, beginning in December 2003 and continuing into February 2004. 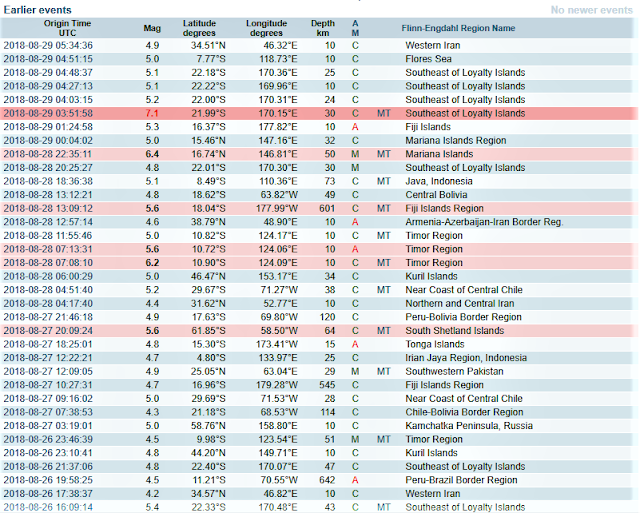 That sequence included both interplate thrust faulting earthquakes (the largest event in the sequence was the M 7.3 earthquake) and normal faulting earthquakes to the west of the oceanic trench (the largest being a M 7.1 earthquake in January 2004). A similar sequence of interplate thrust and outer rise normal faulting earthquakes occurred in October-December 2017, just to the north of the 2003-04 sequence. 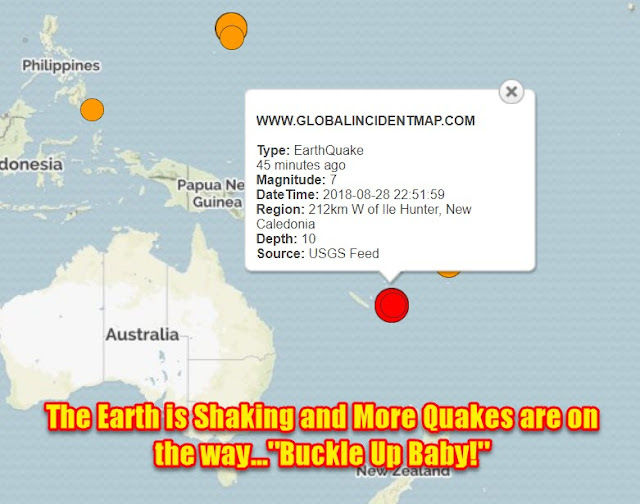 The 2017 sequence began with a M 6.7 thrust faulting earthquake on October 31, 2017. The largest event in the sequence was a M 7.1 outer rise earthquake on November 19, 2017. Between the M 6.7 earthquake and December 25, 2017, about 350 M 4+ events occurred as part of that sequence. Because of their remote locations far from land, these earthquakes do not cause significant shaking in populated areas and are not known to have resulted in damage or fatalities. Large earthquakes are common along the North New Hebrides trench and have mechanisms associated with subduction tectonics, though occasional strike-slip earthquakes occur near the subduction of the D'Entrecasteaux ridge. 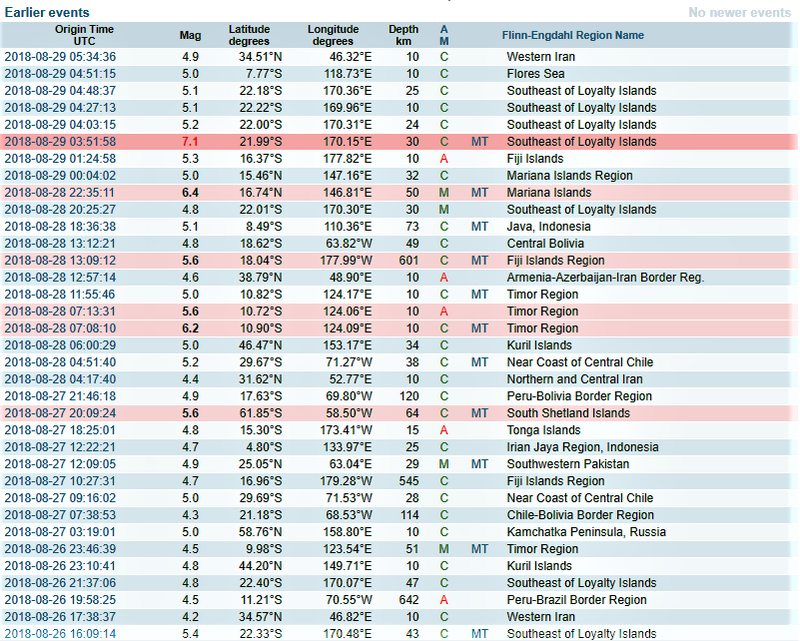 Within the subduction zone, 34 M7.5+ earthquakes have been recorded since 1900. On October 7, 2009, a large interplate thrust fault earthquake (M7.6) in the northern North New Hebrides subduction zone was followed 15 minutes later by an even larger interplate event (M7.8) 60 km to the north. It is likely that the first event triggered the second of the so-called earthquake "doublet".